Meek was one of the great eccentrics of record production and can be bracketed alongside Phil Spector in many regards; odd, sonically adventurous, burned brightly then quickly faded, burdened, ultimately tragic (he suffered from depression and murdered his landlady and then turned the gun on himself six years after this photo). 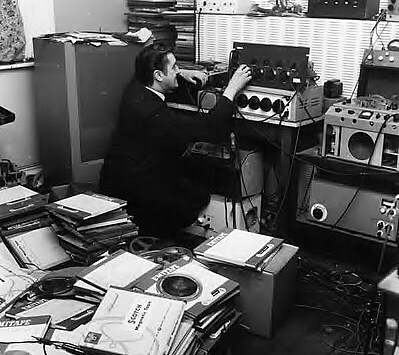 He set up a recording studio in his home in 1961 which was arguable the world’s first bedroom studio. You can see from this picture that he kept the studio as tidy as an average teenager. The first single release from Joe’s studios was this little ditty; Johnny Remember Me by John Leyton (who went on to act in Von Ryan’s Express and The Great Escape) backed by The Outlaws. #1 in 1961. The song was written by Geoff Goddard, a psychic. Leyton was managed by a young and hungry Robert Stigwood who would go on to rule the world with The Bee Gees and Saturday Night Fever.